It is time for the annual doll dress sewing. My SAGA chapter's annual auction and doll raffle is next weekend. This may become my signature contribution from now on. Love this dress. First posted on Children's Corner Inc. I have posted about the St. Louis "Cherry Dress" here and here. Fortuitously, the conversation arose again recently on an online forum. I had planned to make this dolly sized Cherry Dress all along and had forgotten. (My mind is Swiss cheese these days.) I am glad the reminder arose. I used the Kathy pattern from Lezette Thomason's book, Dolly's Wardrobe. 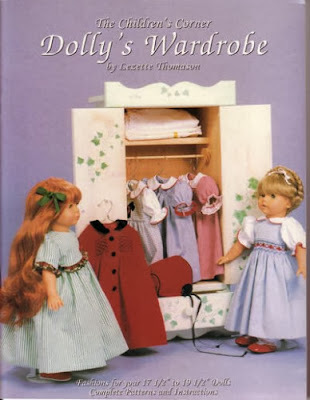 This book is a collection of doll sized classic Children's Corner patterns. I have used it in the past, here and here. I can safely say, after three uses I have gotten my money's worth out of this book. I loved making this dress so much it makes me want to make some others for reserves. Nahhh that won't happen. I NEED to sew drapes instead. All of the materials are from my stash, which is even better. The fabric is Spechler-Vogel poly/cotton pique. Piping is Susie's Ready to Smock piping in red gingham. Both available from many heirloom retailers. 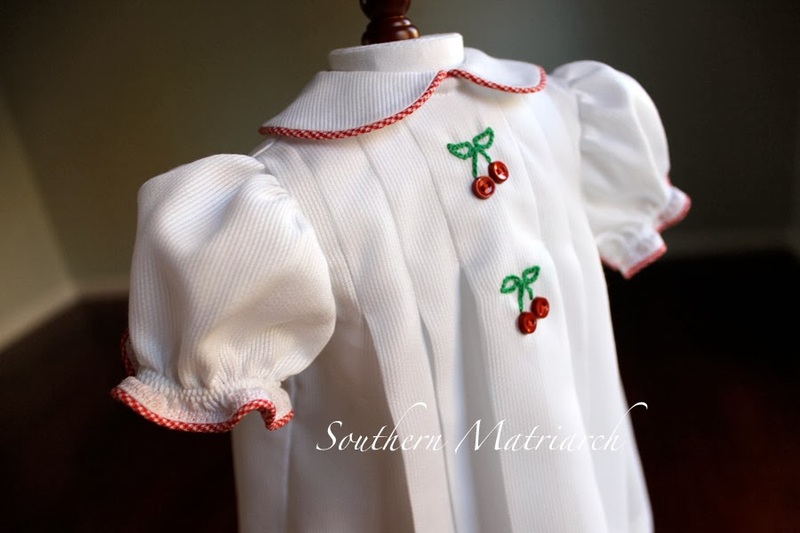 The cherries are JoAnn's craft buttons and the floss, back buttons and velcro are also all from the closet. 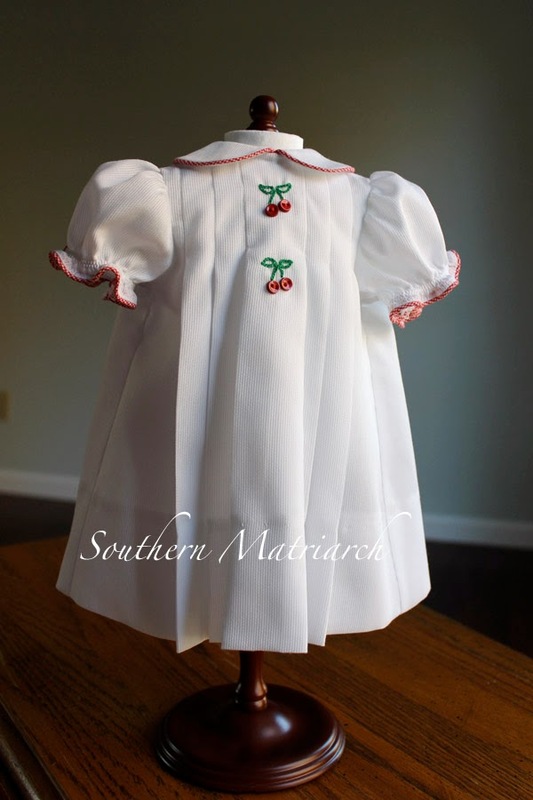 The traditional dress has 3-dimensional cherries. No time for that and not a good idea in case this dolly and her wardrobe are won by a young child. Those swinging cherries would be gone in an instant. Sewn on buttons for cherries it is. The classic dress can be purchased at the St. Louis Women's Exchange. Off to buy drapery rods so I can get started on those drapes. And that long empty space behind the doll dress should be filled this week, furniture has started to arrive. The reno is almost complete!! Thank heavens! Not sure we will be 100% complete before Thanksgiving but should be before Christmas. Merry Christmas to me! What is on your horizon for holiday sewing? Can you say 13 pair of pj's, three matching Holiday outfits for pictures with Santa, as well all of the other ho-ho-ho that goes on? No time to sleep. 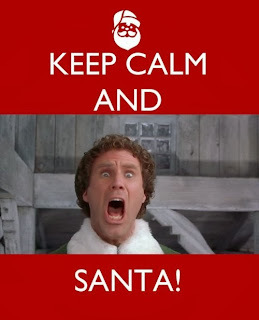 I wonder if you can rent some of Santa's elves? Love the AG doll dress. Your Christmas list makes me "feel" tired. Good luck!